Although the Geostationary Orbit is very practical for those living south of the Arctic Circle, those who reside in the extreme northern latitudes might not be able to detect these satellites because of their very low apparent elevations. In the early 1960's, Soviet aerospace engineers devised a very clever and practical type of orbit that would simulate the convenience of a geostationary orbit, while at the same time service the extreme northern regions of Russia. This orbit would be very highly inclined to the equator, have an orbit period of 12 hours and a distance of between 200 and 40,000 kilometres; the highest range being over the most northern latitudes). This was done to ensure that the satellite would remain over the northern hemisphere for most of its 12-hour orbit period. This orbit type is called Molniya (Russian for "Lightning"). Any satellite orbit that exhibits the Molniya orbit characteristics is sometimes referred to as "Molniya-type". Molniya satellite orbits have been used for European communications partnerships, and at one time was even used for the "Hot Line" between the Soviet Union and the United States. To date, the United States has never utilized this type of orbit. 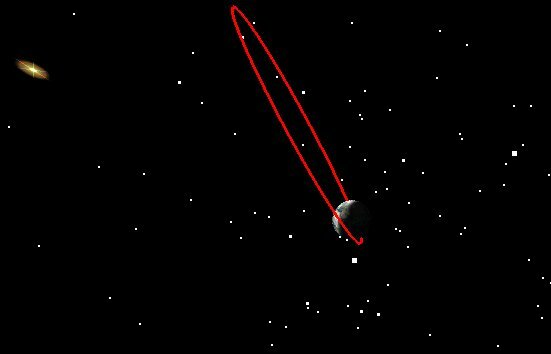 The Molniya orbit is highly elliptical and is highly inclined to the Earth's equator. This is the orbit of the Russian Molniya 1-93 satellite. The Sun is shown in the top left hand corner. This image courtesy of Analytical Graphics Inc. (AGI).